The sireline of Krzyzyk OA came to Poland in 1876 when he was imported to Jarczowce by Juliusz Dzieduszycki who bought him in Constantinople. 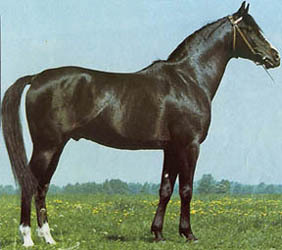 It is the oldest sire line in Poland. The Bairactar OA line is older but it was founded at Weil, not in Poland. There are two major branches of this family from two sons of Mlech I 1897 (a grandson of Krzyzyk OA), Abu Mlech 1902 and Farys II 1905. Mlech I had another son, Pielgrzym 1903, who left three sons, Derbent 1908 (sire of Mustafa 1917), Pielgrzym-Thuja 1909 and Haik 1919. None of them left any stallions that bred on but they can be found on the female side. The smallest branch is that of Farys II and it is no longer active in Poland. 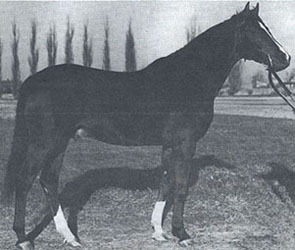 He sired four sons, Kaszmir 1929, Lirnik 1930 (sire of *Chloe 1938), Lotos II 1930 and Lucznik 1930. Kaszmir 1929 was the main representative of this branch. He was an outstanding race horse, 3/18(17-1-0)3xC+9! His only defeat was against a french horse (he won against him in a later race). Kaszmir was very impopular with the betters at the track as they didn't think such a good looking horse could run. They lost a lot of money... Kaszmir was sold to Pelkinie, the stud of prince Czartoryski. He was described by Andrzej Krzysztalowicz as "comparatively big, with a large head of good profile, dry but with a serious defect of too narrow and toed out limbs". He didn't suite the Pelkinie mares very well but left some offspring that bred on. Many of his get were lost in WWII and had he been given a better chance he might have contributed more. His descendants often show good performance abilities. His Janow-bred son Taki Pan 1937 (out of Dziwa) was taken to Tersk and left good offspring there. Kaszmir had two sons used in Poland, Geyran 1936 and Ghabit 1937 (he sired only one get). Geyran left two high quality mares: *Arwistawa and Wieszczka (exp Germany). Geyran's son Cargo 1958 was exported to Babolna and from there to Denmark. The branch of Abu Mlech was continued by his son Enwer Bey 1925. Beside Enwer Bey he left Dziwa, the dam of Ofir. 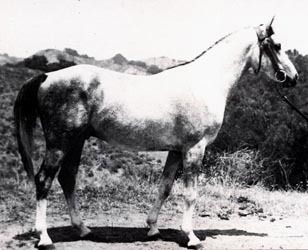 Enwer Bey was a beautiful horse, considered second only to Ofir. 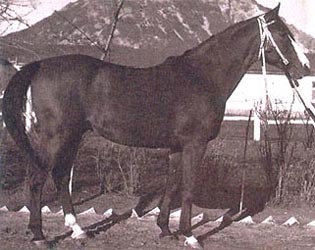 He sired three sons used for breeding: Skarabeusz 1936, Towarszysz Pancerny 1937 and Trypolis 1937. 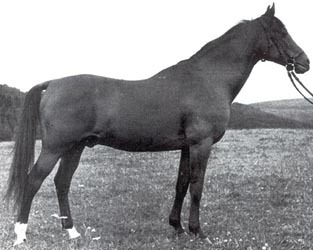 His daughter Taraszcza 1937 was taken to Tersk and was considered one of the best mares there. Enwer Bey were also taken to Tersk but despite that his daughter was appreciated he was considered too small (147 cm) and was discarded. 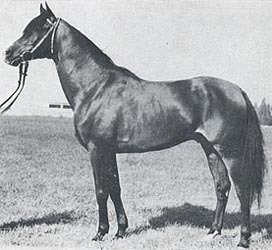 Skarabeusz left only a few get which were lost in the war (he mainly sired get at the Breniow stud which was completely destroyed with the exception of Amurath Sahib). The second son of Enwer Bey, Towarszysz Pancerny (renamed Halef), came to Germany as a refugee when part of the polish arabians were evacuated by the german army. Before leaving Poland he sired one mare and one stallion who were both lost in the war. He was used at Marbach and Achental and left many good offpring. 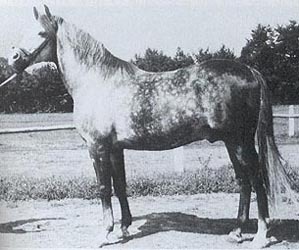 His dam *Kasztelanka was exported to US in 1938 and was the dam of Fadheilan. Trypolis continued the line in Poland, siring three sons used in Poland: Sedziwoj 1954, Faher 1953 and El Trypoli 1957. His sons used abroad are *Pilot 1943, *Ali Bek 1953, *Ardahan 1954, *Mohacz 1955 and *Cytrys 1957. Many of his daughters left stallions used at stud so his blood is well represented. 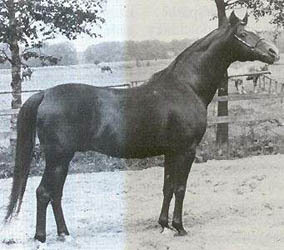 Sedziwoj was full brother to Canaria, the dam of Celebes. He sired one son used in Poland, Ariel 1961 2/14(5-2-3)C+1, and one exported to the US, *Kluszyn 1961. Ariel didn't leave any sons in Poland but was exported to Sweden where he sired three sons, Misza 1979, Nadzin 1980 and *Ariel Bay 1981. 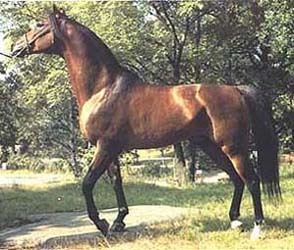 His son sired in Poland, *Galop 1967, was a successful performance stallion in the US. Among Sedziwoj's other get are Pien 1962, winner of the Criterium,*Amfibia 1961 (dam of Ariston), Cisawica 1961 exp Sweden and Cyneraria 1961 exp DDR (dam of Cid ben Afas 1968 exp Sweden). El Trypoli 1957 was an average horse and described by A. Krzysztalowicz: "has a coarse and heavy head, small eye and lacking in type". Seven of his eight daughters were exported and four of them to Sweden where they have been more or less successful: Sake 1962, Grobla 1962, Wielka Este 1962 and *Melhafa-ed-Areg 1964. Faher was the stallion chosen to carry on the Krzyzyk OA line. He was a tall horse, lacking somewhat in type but had a decent head on a rather long neck. He wasn't raced but did his performance testing with partbred stallions. 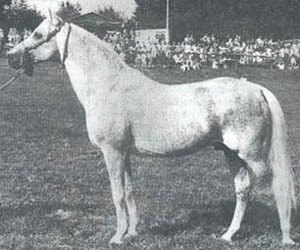 He was the only progeny of his dam Ferha to breed on. She was a dry mare with faulty front legs and lacking in type. Her bad legs was unfortunately passed on, even as far to the get of her greatgrandson Banat. 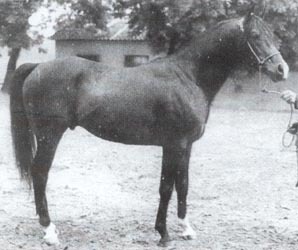 Faher sired three sons used in Poland: Arragon 1959, Almifar 1960 and El Azrak 1960. His daughters have been successful, especially Etna 1959 and Penza 1959. One of his sons was used in the US, *Barysz 1960. *Pilot 1943 was one of the horses confiscated in Germany by General Patton. He was first stationed at the Army Remount Depot (formerly Kellogg Stud, now Cal Poly) in Pomona. When the Remount decided to drop the depot many of the Kellogg horses were to be sold and all of the "war prizes". *Ali Bek 1953 was a circus horse in the group bought by Erik Erlandsson (which also included Nureddin). He left a few get in Sweden and was then sold to Cashvan Arabians, US. 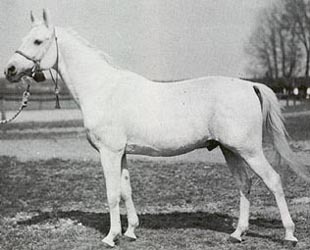 *Ardahan 1954 was one of the horses in the first post-war imports of polish arabians to the United States in. 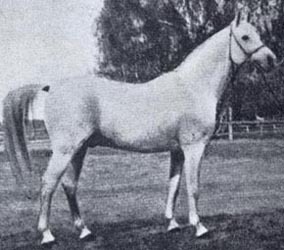 He, along with the other imports, helped start the interest in polish arabians and made many wonder what other horses might be found in Poland. 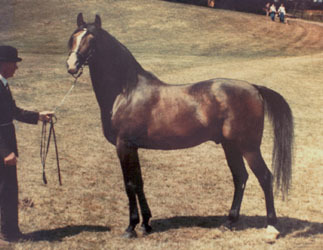 He sired the stallions Eros 1965 and The Aristocrat 1963. *Mohacz 1955 was also one of the 1961 imports, just like *Ardahan. 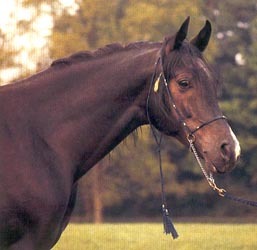 He was to become a successful racing sire, especially through his son Juan de Shawn 1971. 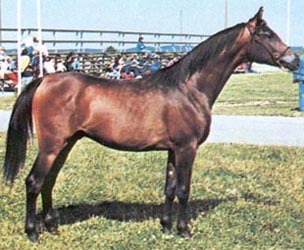 He also sired the good racing mare Bar Kinhacz 1968. His own racing record was 3/16(6-4-3)2. The dam of *Mohacz, Mimonka 1945, was the granddam of *Mimikra 1962 exp Sweden and *Meczet 1961. She was herself exported to Sweden along with her daughter Mimoza 1964. *Cytrys 1957 is yet another of the 1961 imports. 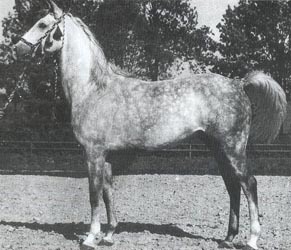 He was imported by Robert Aste but was later bought by Patterson Arabians who used him extensively. Considering the quality of his american-born get he should perhaps have gotten a chance to be used at stud in Poland. His get include the stallions Stargard 1971 and Cygan I 1979 as well as the mares Four Winds Kalifa 1972 and Straga 1972. 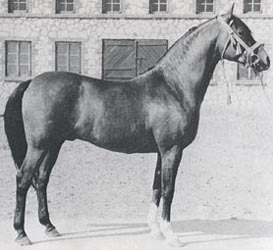 Arragon did not leave any son and was an average stallion used mainly for the preservation of the Krzyzyk OA line. He left a good daughter, Alarga 1969 exp Sweden, and the outstanding race mare Samarra 1964 (winner of the Oaks and the Criterium as well as placing third in the Derby). He was exported to Holland in 1969. 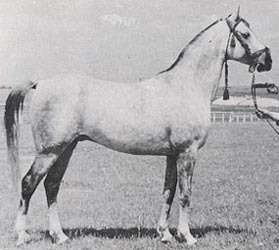 Almifar was a full brother to Arragon and had a greater success as a sire. He had a decent race record himself, 4/22(6-6-4) and sired a number of good racehorses. That is not so surprising considering that many of the descendants of his dam Arfa has been successful at the track. He sire the stallion *Elef 1970 and the mares *Sasanka (racehorse extraordinaire! ), Aranda exp Sweden and then to Algeria and *Ellonga, a valuable broodmare. *Sasanka won the Criterium, the Oaks and the Derby, *Canasta was second in the Oaks and *Elef second in the Derby as well as third in the Criterium. *Elef sired the stallions Wigor 1980, Zenit 1980 exp Sweden and the very successful racehorse *Traf 1980, who raced well in the US too. El Azrak became the chief progenitor of the Krzyzyk OA line through his son Banat. 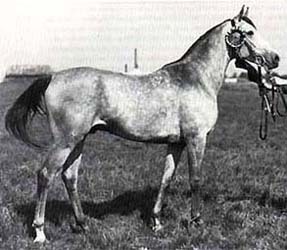 Beside Banat he left the stallions Kanonier 1967, Perset 1969 and Dadzi 1978 but none of them left any lasting mark in polish breeding. Several of his sons have been used abroad as well. El Azrak was described by A. Krzysztalowicz as "dry, handsome, conspicuous by his colour, with dry but incorrect limbs. Noticably big-eyed but with a white ring around the pupil". The sons used abroad are *Eunizar 1969 exp France, Danser 1974 exp Sweden, *Dimrak 1968 exp US in utero, *Brusally El Azrak 1968 exp US in utero and Ferment 1974 exp Germany. Banat was a beautiful horse but with incorrect legs, something he often passed on. According to A. Krzysztalowicz he was "Fairley typey, with a sligtly short neck, but a good back, he had tied-in forelegs for which he was prepotent. He was an average mover and his nervouseness verged on the spiteful". When on lease to the UK in exchange for Burkan he was named British National Champion. He had a decent track record of 4/39(6-3-12). He left six sons, Armaniak 1979, Czako 1979, *Piechur 1979, *Arbil 1981, Gabaryt 1982 and Murat-Nur 1984 (used in private breeding only). In 1984 he was exported to Lasma in US and died shortly after his arrival, before siring any offspring. Armaniak 1979 was leased to France, Tersk and Sweden. He left a few offspring in Poland. Czako 1979 was first used in Poland and then sold to Germany. 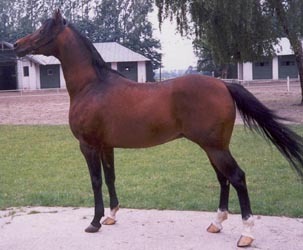 His son Cyprys 1988 has been used in Poland, both at Janow and by private breeders. *Piechur 1979 was sold from the Warsaw track to the US but was later brought back to Europe. He is currently owned by Halsdon Arabians and has been on lease to Poland. His son Arlet 1989 has been used at Michalow. He was a very good race horse, winning the Derby and the Criterium. 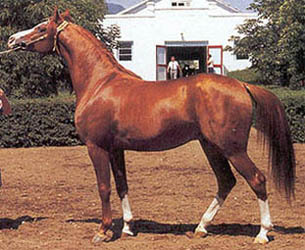 He is also a US National Top Ten stallion as well as European Reserve Champion. *Arbil 1981 was leased to the US 1985-1988 and then brought back to Poland where he stod at both Michalow and Janow Podlaski. In 1998 he was leased to Sweden. He is now owned by Vlasakker Arabians in the Netherlands. He has left the stallions Wachlarz 1990, Fanfaron 1991, Florek 1991, Equin 1992 and Wiek 1992. 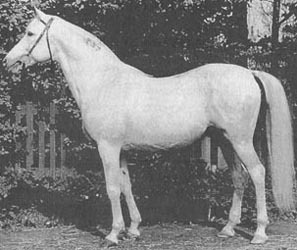 Gabaryt 1982 was used in Poland at Bialka, Kurozweki and Janow Podlaski and was then leased to Nedji Arabians in Belgium. He was also used by private breeders when he was returned to Poland. His son Hart 1991 was imported to Sweden in utero and stands in UK now. Another son, Czif 1995, has been used by private breeders in Poland. 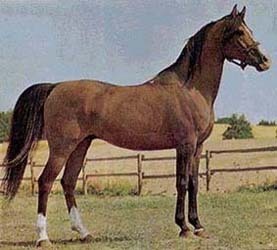 Murat-Nur 1984 was bred by Z. Braur, for a long time one of the very few private breeders in Poland. 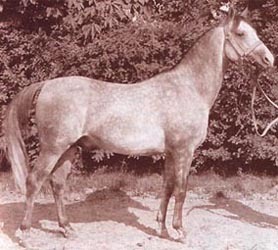 Murat-Nur was only used in private breeding. 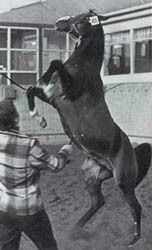 Harfiarz 1979 was never used at stud in Poland but was leased to Tersk for two seasons. He was later gelded. *Alarm 1975 was exported to B. Pietruszka in US. He was a performance champion. *Bancock 1975 was an in utero import to Sweden. He was later exported to US where he was a race champion, 39/4(6-3-12-8), and a champion in English Pleasure. *Al Banat 1982 was exported to Weatherford Farms, US. Eleis 1982 was born in Poland and then exported to Sweden. Lotny was born in UK when Banat was on lease to Patricia Lindsay. He has left several good offspring, among them Khyberie and Ban Kulin. 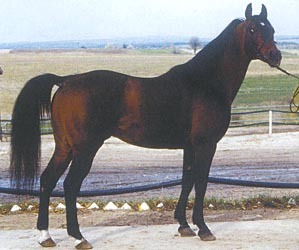 *Bataann 1976 was born in Sweden, his dam had been sent to UK when Banat was on lease. He was exported to US as a young horse and has been very successful as a racing sire. Among his get are the stakes winners NF Proof, NF Risk and Harassment. *Bataann himself was never raced. He is still alive at a ranch in Texas. This sireline is noted for very athletic horses with good movements and, when combined with the right mares, great beauty.